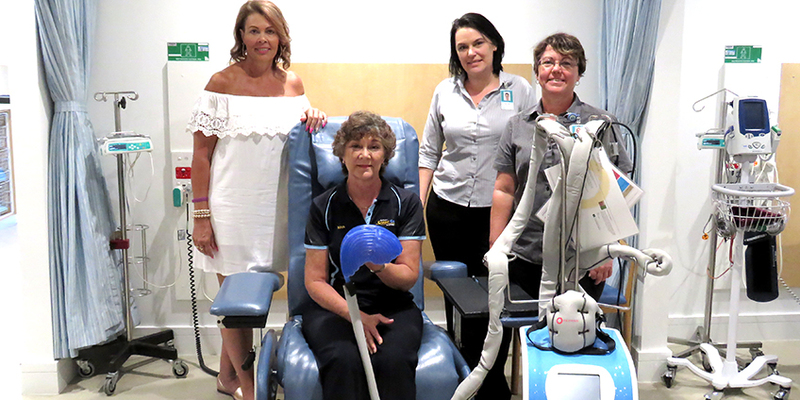 A complementary therapy that limits hair loss in patients receiving chemotherapy has been made available in Bundaberg for the first time, thanks to The Friendlies Foundation purchase of a $50,000 machine. Patients at the Friendly Society Private Hospital have already begun using the Scalp Cooling Machine, which works to reduce the temperature of the scalp immediately before, during and after chemotherapy treatment. This reduces the blood flow to hair follicles which can prevent or minimise hair loss. Nurse Unit Manager of Day Oncology DA Halpin said if a patient wanted access to scalp cooling previously, they had to travel to Brisbane for their chemotherapy treatments. “A lot of patients, especially women, feel very self-conscious when they start to lose their hair as a result of chemotherapy treatment,” Ms Halpin said. The Friendlies Foundation public relations officer Tunja Cottier said the foundation would continue to support the Friendly Society Private Hospital as it worked to grow vital oncology services locally. “The need for oncology services continues to grow,” Ms Cottier said. Helena Adams was the first patient at The Friendlies to utilise the exciting technology. “When I first saw my oncologist Dr Jain, he suggested I could have it done, but I would have to go to Brisbane,” Mrs Adams said. “But as my treatment was weekly, I didn’t fancy having to travel to Brisbane. So I came to terms with losing my hair and had purchased things like scarfs. “Then when I turned up for my first treatment, Dr Jain said actually The Friendlies had a new machine that had arrived the day before. Mrs Adams said as a business owner, preventing hair loss gave her the comfort of choosing who to tell about her treatment. “I have had some natural thinning but I haven’t lost any clumps of hair,” She said. “People who don’t know me wouldn’t know I was having chemotherapy. Scalp Cooling is a simple treatment that can prevent hair loss caused by certain chemotherapy drugs. The use of scalp cooling or “cold caps” is proved to be an effective way of combat hair loss and can result in a high-level of retention. Why does chemotherapy make the hair fall out? Chemotherapy works by targeting all rapidly diving cells in the body. Hair is the second fastest dividing cell in the body and this is the reason why many chemotherapy drugs cause hair loss. The hair follicles in the growth phase are attacked, resulting in hair loss about two weeks after the start of chemotherapy. The damage that chemotherapy causes to the hair follicle can be alleviated by scalp cooling. It works by reducing the temperate of the scalp by a few degrees immediately before, during and after the administration of chemotherapy. This in turn reduces the blood flow to the hair follicles which may prevent or minimise hair loss.